Minneapolis, March 11, 2013-Thirteen side-by-sides, including Jagged X’s Matt Parks and Jason Spiess in their 1932 Jagged X/Polaris RZR XP 4 900, lined up for the first SCORE race of the season, the San Felipe 250. 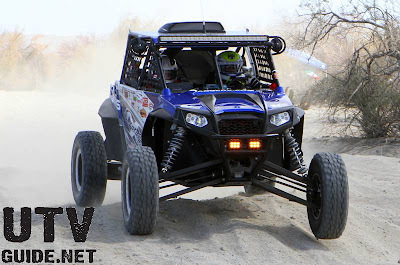 The race was the inaugural race for the “Pro UTV” class in the series and when the dust settled, Parks and Spiess would take the checkered flag and be one of only two side-by-sides to finish from the class. The San Felipe 250 is notorious for being the roughest race in North America with endless whoops, deep silt and rocky sand washes. But after Parks did his pre-run, he knew that this would be a race of survival. “The UTVs start dead last in SCORE races and after 240 vehicles had been through the course, it was unbelievably rough. So, we just decided to set a steady pace and take care of the car,” Parks said. At the 100 mile mark, the Jagged X RZR XP 4 900 was in second place and was working its way through some of the trucks and buggies. At the second fuel stop at race mile 173, Parks was leading by more than 20 minutes and they just needed to bring it home. Driving the last two hours in the dark, the team took the checkered flag and sprayed champagne on the podium at the famous San Felipe arches. The next SCORE race is the Baja 500, in Lake Ensenada, Baja Mexico May 31-June 2. Jagged X is sponsored by Polaris, Walker Evans Racing Shocks, Kroyer Racing Engines, Pure Polaris Extreme Duty Oil, Muzzy’s, OMF, Team Industries, CR Designs, Vision X and Simpson Safety Equipment.